A recently planted Zapote Olimpico seedling. During this past July, while walking through the Cerro Osa forest, Agustín Mendoza, one of the most charismatic members of Osa Conservation’s conservation and land management team, heard sounds and a great deal of activity at the top of the canopy. As he came closer to the site, he realized that the clamor was coming exclusively from a Zapote tree (Pauteria Sp). This tree was full of juicy fruits characterized by an exquisite orange color and a sweet scent that invaded the monotonous serenity of the forest. In the top of the tree he found a complete troop of spider monkeys that jumped from branch to branch, 35 meters in the air, taking advantage of the sudden abundance of this unusual feast. The Olympic Zapote, as Agustín calls it, only fructifies every four years, the rest of the time remaining unseen in the thicket of the forest. After the monkeys moved away with their stomachs full, Agustín, without thinking twice, scaled the over 30 meters to the tree canopy to collect some of the coveted fruits, which he later planted in the nursery so that they could reproduce in the Greg Gund Conservation Center for the first time. 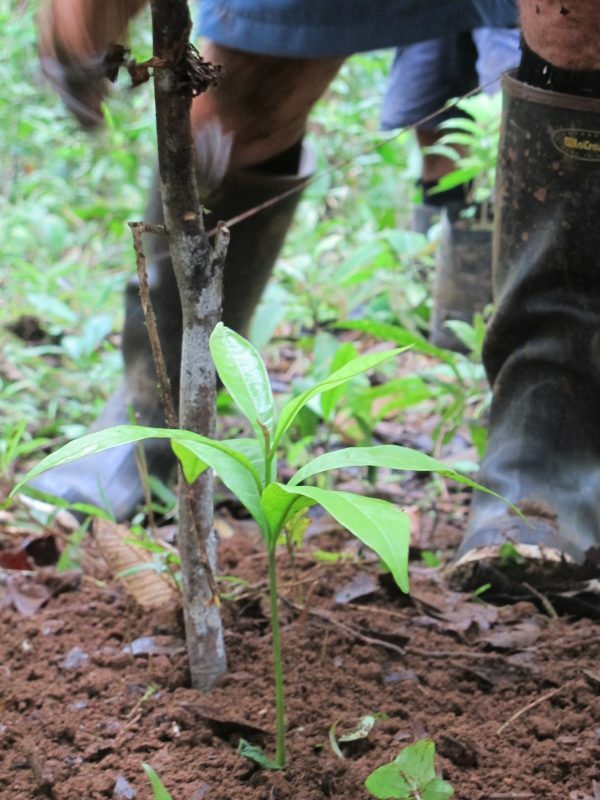 This week, after a little over four months of much care and dedication, we were able to plant the first young “Olympic Zapote” tree in our forest restoration parcels. The reproduction of this tree represents a great achievement not only in caring for a rare species, but also because this project has been converted into a symbol of the dedication, patience, and long-term planning that Osa Conservation’s forest restoration projects require. This entry was posted in Land Conservation and Forest Restoration and tagged Conservation, Festival, forest, fruit, land, max, of, olimpico, olympic, osa, restoration, villalobos, zapote. Bookmark the permalink.